From left are Natalie McLaughlin and Bill Lawton of Community Financial, Beth Troost of MCUL & Affiliates and state Rep. Mike Callton, R-Nashville, chairman of the House Financial Services Committee. April Clobes of MSUFCU speaks about the credit union’s financial literacy initiatives. Members of the House Financial Services Committee listen to Clobes’ testimony. 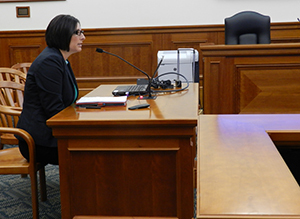 Michigan credit union leaders testified before the state House Financial Services Committee about programs to help with financial literacy as part of National Financial Literacy Month. 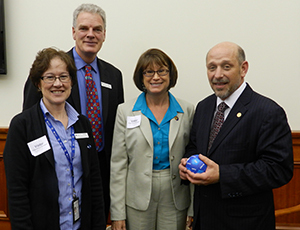 Beth Troost, manager of financial education for MCUL & Affiliates, passed out the Money Matters Thumball and teaching guilde, a financial education tool developed by the MCUL Financial Education Committee to members of the House committee. She said a study by the Corporation for Enterprise Development and the Center for Financial Security at the University of Wisconsin-Madison showed that financial education in schools is critical. “The study shows that classroom financial education does work,” Troost said. MSUFCU COO April Clobes said her credit union has several financial education programs including Lansing Save, where the credit union partners with the city and school district. MSUFCU also participates in another program that helps young people make the transition from foster care to adulthood. Natalie McLaughlin, senior education partnership coordinator at Community Financial, said her credit union operates 39 student-run credit unions in area schools. The credit union started the program in 1990. “We have hired some of these kids as they have gotten older,” McLaughlin said. In addition to the student program, Community Financial made 754 classroom presentations on financial education, reaching 18,000 students 2013. Offering advocacy, information and networking solutions that help credit unions serve, grow and remain strong.